About – You Do Hoodoo? Wesley Moore (aka Rusty), teaches English at a prep school. His first wife Judy Birdsong died of T-Cell lymphoma after 39 years of marriage. From that union, he has two sons, Harrison and Ned, and a daughter-in-law, Taryn. On 4 August 2018, he married Caroline Tigner Moore, who has a daughter, Brooks. Wesley, Caroline, and Brooks live on Folly Beach, SC, the so-called Edge of America, the best surf break between the Outer Banks and Ft. Lauderdale. Gershwin wrote the music for Porgy and Bess on the island. The fish are jumping’, but there ain’t no cotton. 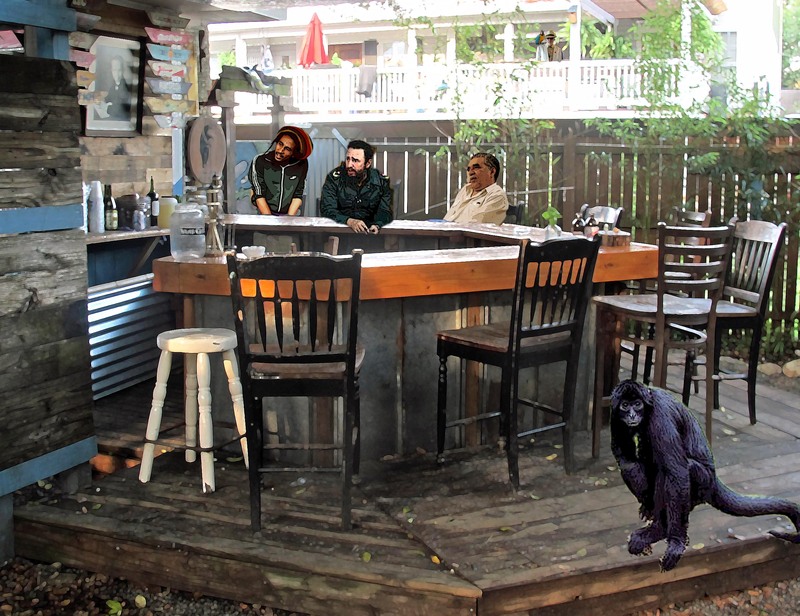 Besides blogging, Wesley’s hobbies include hanging out in bars and making fake paintings via Photoshop. The one below is called Chico Feo in the Morning. Like Hitchcock, Moore sometimes sneaks via cameos into the images he creates. Check out the balcony in the background. I have enjoyed reading your blogs. It gives me a glimpse into the life you shared with Judy. Thank you. Thanks, Leanne. I don’t think I’ve seen you since your wedding. I hope all’s well with you and yours. We’re coping as well as we could hope, I think. Best wishes, Wesley. Can Judy Murdock of the Ray Conniff singers be reached through this blog? A long time friend and fellow singer is trying to reach her. Sorry, Dan. I don’t know Judy Murdock. Hey Wesley, this is Jenny. We met at Chico Feo a couple months ago. Now I am trying to remember the name of your mother(?) or grandmothers(?) dog from the story you told Beth and I. It’s driving me nuts that I can’t remember the dogs name because I really want to name my canoe after that dog. Hi, Jenny. It’s Saisy. My grandmother’s name was Hazel, and her toddling nieces pronounced it Saisy, so it stuck as a nickname. Cheers! Saisy? Really? I remembered a longer name, like something from a Tennessee Williams play? Thanks for responding! Oh now I realize you thought your grandmother’s name. I mean her chihuahuas name. Oh, yeah. Gotcha. Her name is KitKat Hambone Traugott. Haha! I know that was your chihuahuas name 🙂 sorry this is so long winded, but you were telling us about your new dog and how you were reticent about getting it because of a dog from your childhood. The childhood dog is the one whose name is mythically in my mind. Was it Forbidia? Perfidia! (I searched your blog for the story) Anyway, maybe we’ll catch you later. If you don’t remember us, I was the girl who asked you what your ‘holy trinity’ of music is. Glad you solved the mystery, Jenny. Hope to see you at Chico soon!